Although a little late in the season for this, it’s time to talk about seasonal snack food in Starbucks in Japan. Not too long ago I wrote about the seasonal snack offerings here in the US for holiday 2010 and raved about the wonderful chocolate covered macadamia nuts. Shortly after writing that blog post, I heard from one of this blog’s regular commenters, Kaori, that Japan also got some really interesting treats for the 2010 holiday season. 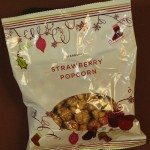 The entire concept of “strawberry popcorn” had me intrigued! 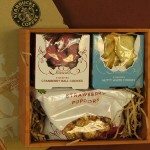 Lo and behold, I received a gift box in the mail with three treat foods from the 2010 Starbucks holiday food lineup in Japan. Though most blog readers here will never try these items or see them at their local stores, it was so interesting I had to share it here. And besides, there are a number of people reading this site who come from Japan! 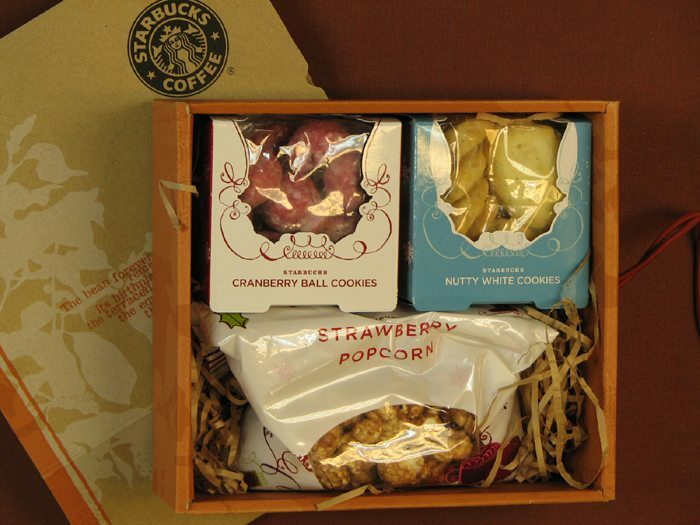 The three Japan treats were Strawberry Popcorn, Nutty White Cookies, and Cranberry Ball Cookies. I want to point out that the U.S. Starbucks do regularly sell popcorn at this time, and it is available in two flavors: (1) Butter and (2) Salt and Pepper. If you want to go back and read my previous blog article on the popcorn available in United States stores, click here. Strawberry Popcorn – This was surprisingly good. The strawberry flavor is pretty mild, and it’s really not all that sweet. It doesn’t taste very real though. Somehow the strawberry tastes exceedingly artificial. It is essentially mildly sweet popcorn with a strawberry essence to it. I would buy this if it were offered here, though not on a regular basis. I still like the classic butter popcorn available in the United States Starbucks better. However, I like the strawberry popcorn better than the salt and pepper flavored popcorn. I always like to include the warning that one should brush and floss after eating popcorn! Popcorn easily gets stuck in periodontal pockets and can be the start of an abcess. 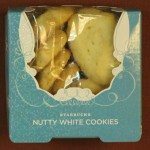 Nutty White Cookies – The nutty white cookies are absolutely delicious. They’re essentially a shortbread cookie. Crunchy, not overly sweet, and lightly buttery and nutty. I wish we had had these here this past Christmas. These are the perfect little cookies to serve to a guest with a cup of coffee, or to have handy to dunk into your cup. Perfection. As most coffee masters know, nutty flavors easily complement coffee. These might be fabulous with Organic Shade Grown Mexico or with Guatemala Antigua. These cookies taste like something that you might find in your grandmother’s kitchen made as a holiday treat for home, or for a cookie exchange. They taste natural and don’t have indiscernible unnatural sugar flavors. 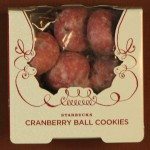 Cranberry Ball Cookies – These are the sweeter counterpart to the nutty white cookies. They don’t particularly taste like cranberry but do taste like they have more sugar added. I like these cookies but they are not the perfection of the nutty white cookies. These would be a little harder to figure out which coffee exactly pairs with them too. The artificial pink/red color is not a natural looking color either. I think these cookies too are supposed to have some nutty flavor in them, but that is overpowered by the sugary flavor. Oddly, these cookies have something in them that is kind of chewy and I think it is supposed to resemble a cranberry bit. This cookie gets one thumb up and one thumb down. Might be fabulous if you’re craving something a little sweeter, but not nearly as delightful as the nutty white cookies. As I snacked my way through this blog post, I am reminded that one thing I want Starbucks to improve upon is their efforts to make sure food pairs with coffee. 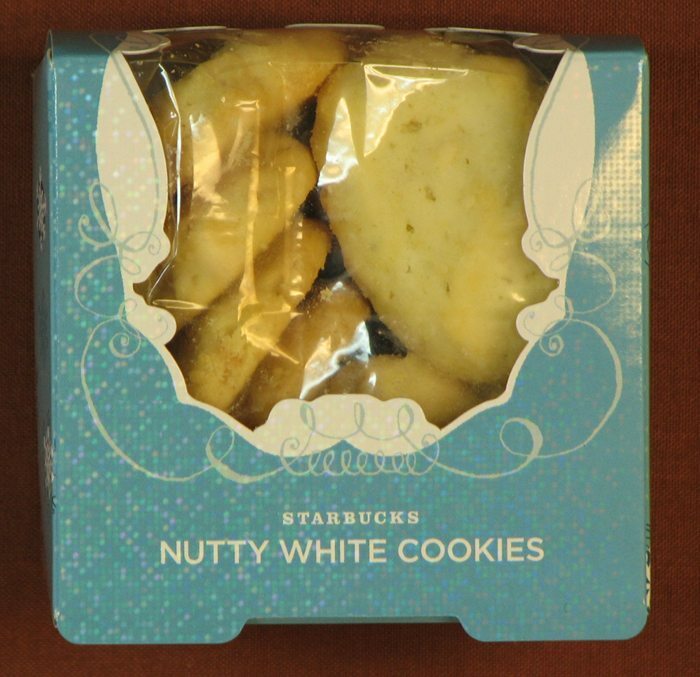 When I previously wrote about the Black and White cookie at Starbucks, I noted that the packaging says right on it that those cookies pair with Sumatra. I am sorry I don’t have photos of the reverse of these three snack items, but in any case, it’s entirely in Japanese. Maybe there is a core coffee mentioned, but I can’t tell. My point only is that the overwhelming majority of new Starbucks food products seem to get launched in the stores with zero conversation about which whole bean offering will pair nicely with the coffee. I’d like to see the care put into the packaging to include a mention of a coffee pairing suggestion, as has been done on the Black and White cookie packaging. This is an open thread. Talk about anything Starbucks-related. Also if you’ve tried these snacks, please weigh in! The most I’ve seen in my life is butter “movie-style” and cheese! I would so love to try the cranberry balls, too! I have to hand it to you, your written representation gave me a “taste” of each treat. I didn’t get to view the back of the packages so I have no idea if it says anything about food pairing…but it would have been nice if they did. I know that whenever we get a new blend they do suggest something to pair it with. Although I haven’t tried it yet, Guatamala Casi Cielo with Chocolate Crunch Cookies or Guatamala Finca El Faro with Caramel Apple Bar are the most recent ones listed on Starbucks Japan website’s food pairing page. I now brush my teeth quite often after eating popcorn after reading your blog. Very nteresting to see these options. I have never been a fan of popcorn in Sbux, altho I do llike popcorn in itself..I just don’t feel it belongs in Sbux. As for Strawberry popcorn……I don’t have to taste it to know it’s not for me. That just sounds wrong. butter, caramel, cheese…….. plain……… alll seem plausible to me but not strawberry on popcorn. not for me. I can see from your tastings that the ‘nutty white cookie’ sounds the most desirbale for me. Oh those nutty cookies sound great and it is so odd because this am at SB I was eyeing the shortbread cookies on counter. Why do you think they offer these treats abroad? Because of vendor relationships and cost? Demographics? Still have not seen the chocolate dipped madeleines! That’s not even fair to post about something like that when we can’t even get it on this continent. I’m now craving strawberry popcorn. @purple1 I think I know the shortbread cookies,at the register in small little yellow packages but these nutty white ones are FAR superior. The standard shortbread cookie at Starbucks tastes disappointingly of butter and flour. @Frenchbean – LOL – I think the strawberry popcorn would really sell! It’s as artificial as cotton candy in taste, but comforting like eating some concoction where jelly beans meet popcorn. Found the chocolate dipped madeleines and will have them tonight. And yes Melody those are the shortbread cookies I speak of the ones near the register. Hi Peggy! In 1973 to 1975 there were no Starbucks in Japan yet. I’m sorry, I know it’s not very fair but this blog does cover things at times that are almost impossible to get in the United States. I’ve just been super lucky (and so thankful) that customers in Japan, like Kaori, and also Noboru Sakamoto, have sent me gifts out of their own pocket, and just out of the goodness of their hearts. I have to agree that the register shortbread cookies are just too flavorless and dry. I forgot to say “dry” too, but absolutely true. @Kaori – It’s very rare these days for any foods at Starbucks to have coffee pairing suggestions, but it used to be more common in the past. If you go back and look at the blog post on the 2003 Starbucks blender, every blended drink had a paired coffee suggestion! The Black and White cookies have a coffee pairing suggestion, but that is definitely the exception, not the norm! I agree with having more suggestions with coffee/food pairings. I remember when we had one or two pastry tags in the case that suggested a pastry to go with Pike. I would specifically like more of those types of tags in the case. But I know our whole bean coffee packaging describes the coffee. For example, Casi Cielo has “Cocoa and lemon notes” printed onto the package right underneath the big Casi Cielo letters. So one would assume that this would go well with chocolate and other chocolate-y desserts. Also, sometimes during promotions we’ll have chalk art or posters suggesting a pairing. For example, during the summer when Passion Tea Lemonade was a featured drink, one of the partners here drew that along with a lemon raspberry loaf and wrote some sweet words ;-). Thanks for sharing treats from the other side of the globe! I never stop to think about the different offerings in different countries. Have you tried the new chocolate dipped Madelines? In my opinion, the Madeline is so delicious on its own– it doesn’t need the chocolate. Finally tried the chocolate covered madelines and they are good but not great. I guess you have to be in the mood for them. @CD: yes Garretts! that’s popcorn!!!!!! I fully agree with denise r, I don’t think the Starbucks coffee company should market popcorn at all, and I certainly don’t think strawberry popcorn sounds appetising, but it’s sounding like we may be in the minority on that opinion. @kimmy @purple1 – I like the choc dipped madelines, but the B & W cookie was way better! @DeniseR – What is Garrett’s? What’s the weather like in Chicago in March? @Tobias – In some ways, I think the popcorn is an example of the kind of odd products that Starbucks might market under the new logo. I think the vision (and I guessing!! Take this with a grain of salt!!!!) … I think the theory with the new logo is that things like the popcorn that DO sell well in the stores could then be later marketted into the grocery business with the new Starbucks logo. A new avenue of profits. ? Sorry for typos, I’m in quite a hurry. Hey folks!! I figured it was time to stray away from the insanity at msi for a dose of sanity here. @ Melody – Garrett’s is like a Chicago Institution when it comes to Caramel Corn. They have great Cheese Popcorn too. They have locations in OHare Airport also! In Oak Park Illinois, is a place known as Madly Pop’n, that sells many candy coated flavors of popcorn. Their website is limited compared to what the store sells. Their best mix is a key lime / cinnamon mix – I kid you not. I’m wondering if this strawberry popcorn is candy coated or just flavored? The weather in Chicago in March? Could be 70 – could be snowing! @ Mel – You have my word! None of that msi stuff from me here! I see Mt. Prospects in the house! @Chgo – Do you live in Oak Park? I used to live there and love that town! @ CD – Born in North Austin – Raised in South Austin! Does the Island ring a bell (Austin & Roosevelt)? Spent my summers jumping off the platforms at Rehm pool and winters skating at Ridgeland Commons! I guess you can say it would be rare not to find me around Harlem & Lake most weekends, at least one day. I love the OPRF area and Forest Pk. has improved greatly! darn! I just wrote a whole thing and hit somehting inadvertantly and POOFED it away. Hi Chgo and welcome. Yes, it’s me, Mt Prospects in the house! And NOW, amazingly, we have two west siders from Austin! (sorry CD, I never heard you grew up in Austin??? our mutual territory should be Oak Pk) We went to Ridgeland too, once in a blue moon when we were lucky…but spent amny many days shopping in Oak Pk in the 60’s. gotta run…..and allow snow time.